In a recent report, BI Intelligence analyses the impact of 4G LTE and device design improvements on mobile video growth, examines who watches mobile video and how they watch it, and details the mobile video monetization opportunity. Significant mobile device growth to come: Over the last two years, the U.S. mobile video audience increased 77% to 36 million viewers. The U.S. smartphone market is relatively mature, but globally, we are still early in the smartphone revolution. Plus, tablet sales are expected to explode in the coming years. 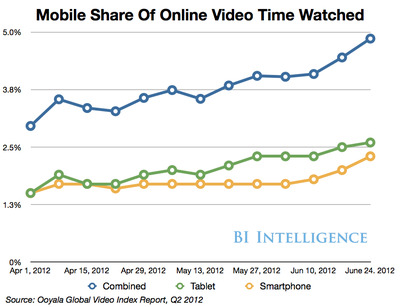 More mobile devices means more mobile video consumers, and more mobile video consumption. Increase in 4G LTE accessibility: 4G subscribers in the U.S. are 33% more likely to watch a video on their smartphones than the average mobile user. 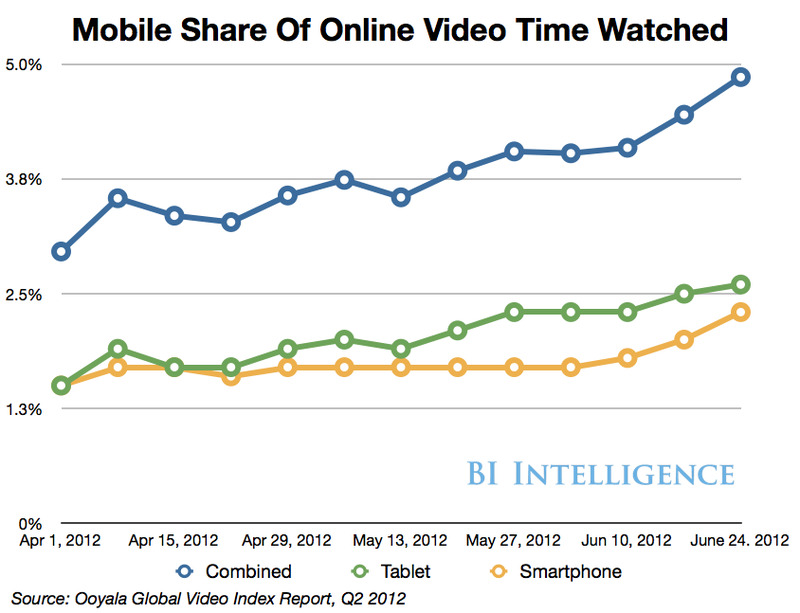 Increased accessibility to 4G LTE and improvement in bandwidth generally should mean more mobile video viewing. Mobile video viewing appears to be additive: Mobile offers new opportunities for video viewing, as smartphones and tablets offer options in terms of both when and where content can be viewed. This plays perfectly into the increasing trend of consumers accessing more and more content on the go and on demand. Device design also helps: Smartphones are now integrating larger screens and speedier processors. And the increasingly popular mini tablet format is perfect for on-the-go video. But, carriers may have a lot to say: Mobile video already accounted for more than 50% of global mobile data traffic for the first time in 2011 and will demand more and more bandwidth as consumers embrace it. The big question is how carriers will respond to the resulting data demands. If carriers limit data with tiered plans and high prices, mobile video’s potential could be stifled.